I hinted at exciting posts to come after Christmas. Perhaps I tempted fate – the plan had been to go to Barcelona for Christmas and come back with lots of stories to tell. Unfortunately, rain happened, and Gatwick North flooded, and I made it back to Euston M&S just in time to scoop some salmon en croute and roast veg off the shelves. My solo, ready-meal Christmas was surprisingly tasty, but I’m not lining up to repeat the experience! The one good thing was I managed to get three strangers to Kings Cross and Euston in time to catch trains to their Christmas destinations. I’ve been reading lately about how generosity can make us happier, and I can attest to that. I really love that peculiarity of Britishness that means we don’t speak to or even acknowledge each other unless something goes wrong, but then the Blitz spirit kicks in and we pull together. Roll on the new year then. January was full of good intentions and empty of alcohol. I made it through the month but I’m rather glad to be back off the wagon. Wine has never tasted so good. Food, on the other hand, has been super healthy. 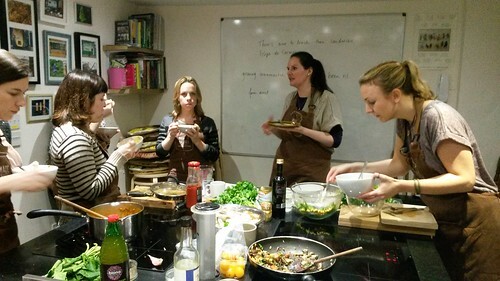 The workshop I attended was one of the “pay what you want” Sunday workshops, on making packed lunches for work, with Portuguese cook Filipa. Over the course of a couple of hours we made several different recipes, before devouring them all together. We had been asked to bring a lunchbox along for leftovers, but no chance! 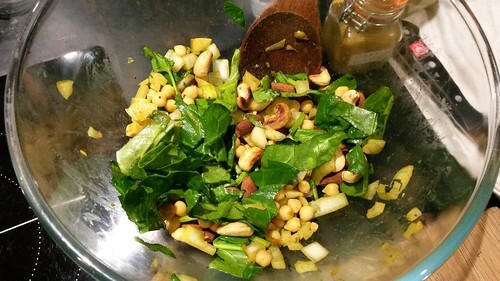 Curried chickpeas – 15 minutes to make. I’ve already made this one for a packed work lunch. A great group of people to cook (and eat) with. When I arrived at the workshop I was feeling a little harried due to a late bus. I left feeling deeply contented. The brilliant thing is I can bottle that feeling – or at least box it up – and carry it to work with me every day. It just takes a little planning and creativity. 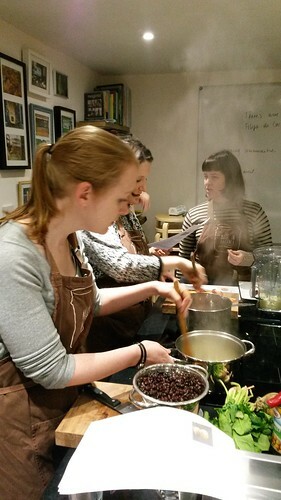 Filipa has kindly let me share one of the recipes from the course. I can highly recommend checking out their other courses – and whatever you pay helps subsidise their work with low-income and vulnerable groups. In a skillet, sauté onion and garlic in the oil for eight to ten minutes, or until golden, soft, and fragrant. Add 2 cups of the beans, the cumin, the paprika, the chili powder, the sea salt, and pepper to taste. Stir until all is warm. If you don’t have a food processor, just add everything to a bowl and mash with a potato masher, that’s what I did, because it’s faster and involves less washing up. Transfer mixture to a mixing bowl. Add the last cup of black beans and the corn and mix well with your hands. Check for seasoning and season to taste. 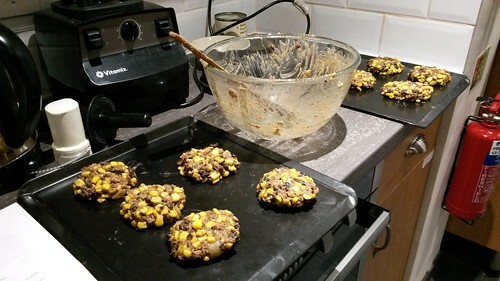 If the mixture is too mushy to form into patties, add a little more oats. Shape mixture into 8 large or 10 smaller burgers. Transfer burgers to a baking sheet and bake for 30 to 35 minutes (or until golden), flipping once through. Alternately, you can chill them for twenty minutes before transferring them to a grill and cooking through. You can also pan fry them in coconut oil until golden on each side. This is a great recipe to make ahead and freeze, for those days you have no time to cook. I usually defrost the night before and then just get a side salad from the supermarket to have in my lunch break.